WASHINGTON (CNS) -- A 33-year-old telephone and internet subsidy that actually lived up to its name, Lifeline, is in danger of being slashed by the Federal Communications Commission. The cuts to Lifeline could take place within two years of the FCC having strengthened and expanded the program. The initial comment period for the public to weigh in ended Feb. 23; a four-week extension was granted, ending March 23. The 2018 FCC, though, is not the 2016 FCC. Then, under a Democratic president, there was a 3-2 Democratic majority on the commission. Now, under a Republican president, a majority of the commissioners are Republicans. Lifeline serves an estimated 11 million U.S. households, but that number is only about 30 percent of those eligible to receive the subsidy -- a modest $9.25 total a month. Under the FCC's proposed rules, the Lifeline budget could be contracted in the middle of the fiscal year if its spending projections predict it will exceed its budget. That isn't a worry now, as Lifeline is budgeted for $2.25 billion and spends about two-thirds that. But another proposal would cap the budget at its "historic" usage levels. The money is collected through the "universal service fund" fee on phone bills, which pays for Lifeline and three other federal initiatives, but capping the budget and thus denying an opportunity for millions more to enroll in Lifeline would be the opposite of "universal" service. Lifeline service, under the proposed rules, could be provided only by "facilities based' providers. That would shut out non-facilities based providers such as Boost Mobile, Virgin Mobile and TracFone, who lease network capacity from AT&T, Sprint, Verizon and other telecommunications giants. 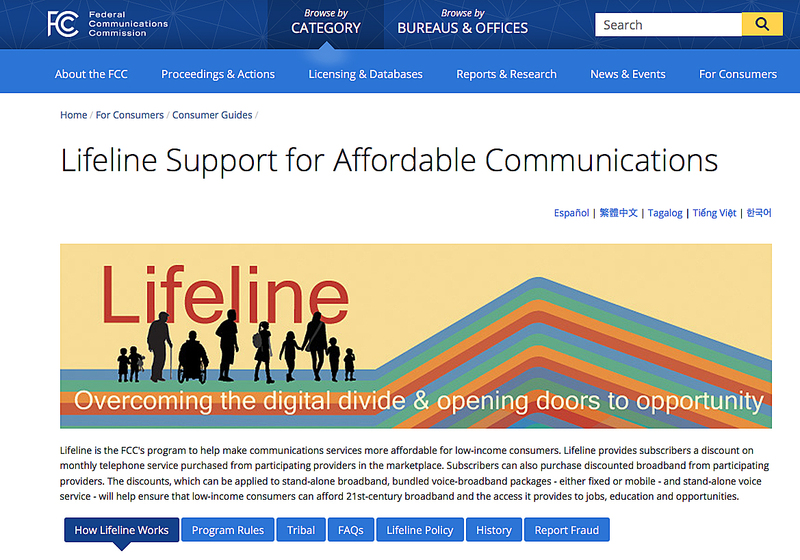 FCC Chairman Ajit Pai in an October 2017 statement said the program needed "a fresh look ... to focus on how the program can more effectively and efficiently help close the digital divide by directing Lifeline funds to the areas where they are most needed." If the rule goes into effect, 75 percent of the Lifeline subscribers, about 8.3 million households in all, will have to scramble for a new provider. In some areas -- including entire states -- the only Lifeline providers are those that lease their capacity from the big guys. There ought to be plenty of competition, argued Public Knowledge senior policy counsel Phillip Berenbroick at a March 12 congressional briefing on Lifeline, because "today's Lifeline subscribes become tomorrow's customers," and tend to not change providers when they no longer need Lifeline. Some of the big telecom firms had backed away from providing Lifeline service, he added, because they didn't want to be in the position of determining who was eligible and who was not. That was fixed in the 2016 FCC Lifeline Modernization Order by setting up independent third-party verification and by cutting out some eligibility markers such as Temporary Assistance for Needy Families and free school lunch in favor of the Supplemental Nutrition Assistance Program, or SNAP; Medicaid; Supplemental Security Income, or SSI; and others. But "it takes time to coordinate 50 states" into one verification network, said Carmen Scurato, vice president of policy for the National Hispanic Media Coalition, and the project won't be completed until late next year. If the rule goes into effect, 75 percent of the Lifeline subscribers, about 8.3 million households in all, will have to scramble for a new provider. Responding to the waste-fraud-abuse mantra often directed at government aid programs, the National Association of Regulatory Utility Commissioners had this to say in Lifeline comments filed Feb. 21: "We have been partners with the FCC in reducing that abuse. It is true, of course, if the FCC imposes changes that significantly reduces the number of eligible subscribers to the program, it will likely have some impact on abuses. After all, if you spray Roundup on your lawn you will definitely kill all the weeds choking the grass. Unfortunately, you will also kill all the grass." Another component of the 2016 FCC Lifeline order was authorizing a national designation for Lifeline broadband providers, rather than have them go through a state-by-state process. By the end of 2016, nine such providers had been designated. But in February 2017, the current FCC revoked all nine designations. Lifeline has been derided in some quarters as "Obamaphones," but the Lifeline telephone service was established by the FCC appointed by President Ronald Reagan, a Republican. It was expanded to include wireless in 2005 under the FCC appointed by another Republican president, George W. Bush, after the devastation and displacement wrought by Hurricane Katrina. Stand-alone broadband service was added, by in the President Barack Obama-era FCC in 2016. FCC Commissioner Jessica Rosenworcel noted at a Dec. 1 symposium, "The future belongs to the connected. No matter who you are or where you live you need access to modern communications to have a fair shot in the 21st century success. But the fact of the matter is that today, too many Americans lack access to broadband." Currently, only half of the low-income households in the lowest economic tier are subscribed to broadband service, and 43 percent say that the biggest reason for not subscribing is the cost of service, according to comments filed Feb. 21 by the National Hispanic Media Coalition. "Of those who have subscribed to broadband service, over 40 percent have to cancel or suspend the service due to financial constraints." Megan Foster, a senior policy adviser for U.S. Sen. Tom Udall, D-New Mexico, said at the March 12 briefing she had used Lifeline when she was a college student, and is now an enthusiastic backer of it. Another element of the FCC plan is a co-pay for Lifeline, which critics say will dampen usage of the service. The FCC also has proposed putting a lifetime cap on eligibility, in much the same way a cap was put on welfare benefits in the 1996 welfare overhaul. But to do so, the National Hispanic Media Coalition filing said, "would require that any Lifeline recipients be tracked for life, triggering an exponential increase in the administrative burdens of the program." "No matter who you are or where you live you need access to modern communications to have a fair shot in the 21st century success." Perhaps most damaging of all the FCC proposals is the one that would remove Wi-Fi enabled devices from Lifeline. "If you've got only so many minutes in your bucket, you're going to burn through that pretty fast," Berenbroick said. Puerto Rico has the largest percentage of Lifeline-eligible residents using the service at 60 percent. It has proved to be a lifeline for one village visited in early March by Rosenworcel and former commissioner Gloria Tristani, who claims some Puerto Rican heritage. "In this village, 100 percent of the people were on Lifeline," said Rosenworcel at a separate March 8 Senate briefing on the issue; she had returned from Puerto Rico late the previous night. The effects of FCC proposal if adopted as-is, according to the National Consumer Law Center, would cut off 75 percent of Puerto Ricans' eligibility, about 369,000 people.